Jakko In, located in Ohara valley, Kyoto, is a nunnery of Tendai sect of Buddhism, and it is said to have been founded in 594 by Prince Shotoku (聖徳太子) to pray for enlightenment of the departed soul of his father, Emperor Yomei (用明天皇). The first abbess, Princess Tamateru ( 玉照姫) who is also known as Ezen-ni (恵善尼), was also a wet nurse of Prince Shotoku. In 2000, the main hall was burned severely and was rebuilt in 2005. In this picture, you can see the iron cast lantern called, Yukimi-Doro (雪見灯籠), which was donated by Toyotomi Hideyoshi (豊臣秀吉). 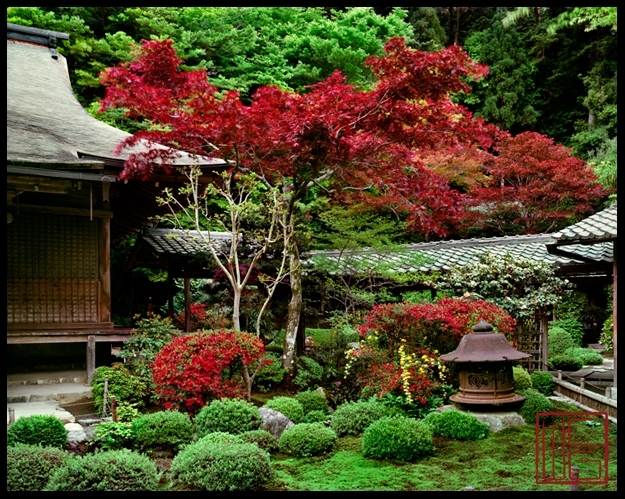 The shape and the color of the temple to the left and the vivid red color of the tree in the middle of this section of the garden is echoed in the lantern located at the right hand foreground and the surrounding azaleas blossoms as if to show the relation of macro and micro-cosmos. While the lantern holds the fire within to give out light, the temple offer comfort and enlightenment to the troubled souls.